Sylvania Tree Farm is officially my favorite place to camp. I know I’ve always touted the appeal of the walk-in spots at Little Pond State Campground where you can hike in and camp right on the lake. It is nice, but you know what, Sylvania is nicer. Why? Sylvania has camp sites right along the Delaware River that are large, private, and beautiful. Before we get into too much detail, let’s talk about having a toddler so close to the river. Depending on the age of the kiddo, it could be a little scary. The water can move fast, and because it’s right along a moving river, young kids will require 24/7 supervision. We went with Sally a few years ago before she was mobile, but last summer (at 16 months) it would have made me way too nervous to have her that close to a river while camping. Now, at 2.5, she understands when something is dangerous. When we first got to the site, we hammered home that she couldn’t go down by the river without an adult and still always had an eye on her, and Sally did great. But if you have multiple young kids especially, maybe wait until they’re a little older for peace of mind. That said, going with adults or older kids, being right on the river is great! In years past, we’ve brought inner-tubes to the campsite, tied them up to a tree along the bank of the river, and just floated in one spot while drinking beer and chatting for hours. It’s like tubing without going anywhere! Very peaceful times, ya’ll. In addition to most of the sites being right on the water, there are plenty of other great reasons to camp at Sylvania Tree Farm. First and most importantly, the sites are large and very private. Most of the campgrounds we go to have large sites and privacy, but many out there do not! And when you’re camping you want to feel at one with nature right? With larger sites can come one drawback, fewer trees and shade. Some of Sylvania’s sites are a little sunny, but with the river right there, it’s usually not much of an issue to cool down. Plus, if it’s a hot day, the owners of the farm will set up a large umbrella at your picnic table. Wait, what??? That’s right. This is one of the reason’s Sylvania Tree Farm is so special. It’s a PRIVATE campground. Not a state park. And with that comes the love and care you’d expect from a family-owned and operated campground. Now, it is a bit pricier than your typical public campground – $45/person, which gets you two nights of camping. BUT, it’s worth every penny!!! We mentioned the umbrellas. Here are a few more perks. Like most campsites, you can buy firewood, but Sylvania delivers the wood right to your site! They also take away your trash for you when you leave. BUT, the best bang for your buck (besides the location) is the bathroom! Yes, the bathroom. I grew up spending a lot of time in porta potties at horse shows, so I’m not prissy when it comes to where I use a restroom. That said, the bathrooms at Sylvania are just sooooooo much nicer than any other campground I’ve ever been to. 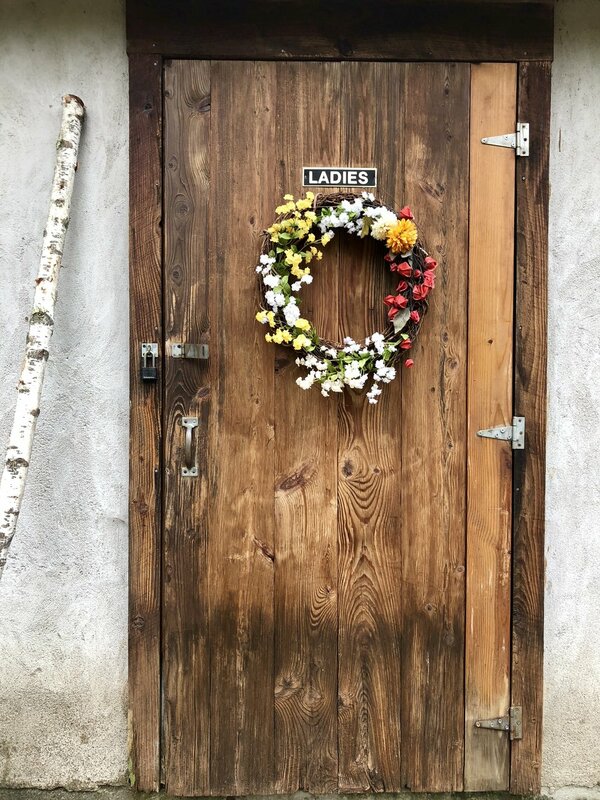 The bathroom is in a cute building with flower wreaths on the doors. There are 2 spacious real flushing toilets and a large clean coin-operated shower. There are two sinks with hand soap and paper towels, and outside of the bathroom is a hose and zone to wash our your dishes. I know it sounds stupid, but having a nice bathroom really does make a world of difference. Especially with a kid! As I mentioned, some of the campsites are not that “woodsy”, but this year we had the option of the furthest-most site on the eddy, and I couldn’t recommend it more! It was the best of both worlds – woodsy AND right on the river! We had a blast! PS- In addition to the excellent camping, they also have 4 cabins/cottages in the woods that they rent out. We haven’t looked into those, but I’m sure they’re well-worth exploring! Because it was October, I wasn’t even thinking about rafting down the Delaware, but we did see a few folks float on by (the object of Sally’s binocular viewing). I’ve gone tubing with friends down the Delaware numerous times before and it’s always an awesome day. You can attach a cooler to your tube and just float your worries away. The water here is “lazy river”-style with limited rapids and the rapids that you do encounter are easy and fun. Just out of curiosity I called one of the places that I’d rented tubes from before, Indian Head, and kids need to be 67lbs for TUBING for safety reasons (duh), but I did find out that kids can RAFT down the Delaware at only 30lbs! I CANNOT wait to get Sally out there next summer in the raft! If the weather isn’t ideal for being out on the river, there are some scenic rail journeys nearby, which I am sure are particularly lovely in the fall offered by The Stourbridge Line. On the way home we drove across the Roebling Bridge to the New York side of the Delaware. This bridge is well worth driving across as it’s the oldest existing suspension bridge in the United States built by John Roebling, of Brooklyn Bridge fame! The road it’s off of hugs the river for a while and it’s a really gorgeous drive along Route 97. There’s a part called the Hawk’s Nest that is apparently a spot where a lot of car commercials are filmed and you can see why! There are a number of turnouts and I recommend stopping at at least one to have a peak over the stone wall to see the Delaware River winding below you. We kept driving to Port Jervis, NY, which is where New York, New Jersey, and Pennsylvania meet! There is a cute strip in the old part of town by the train station where we stopped for dinner. We ate at the Fox N Hare, which is a small brewery with craft beer and also serves food. A delicious burger and craft beer is an ideal way to end a weekend of camping!